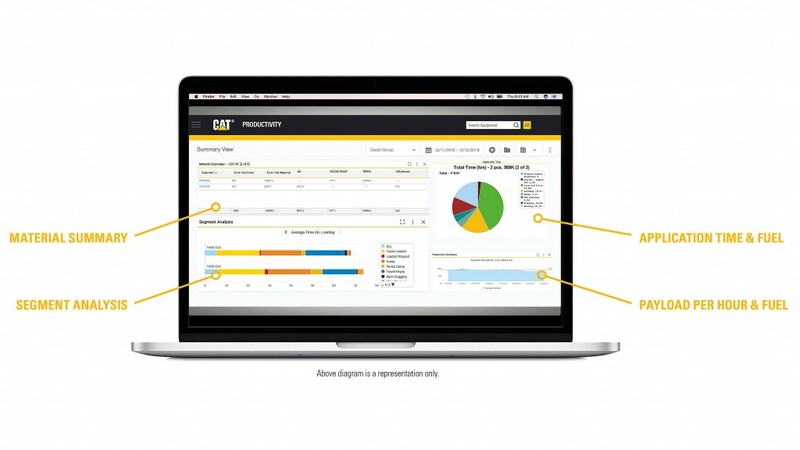 The Cat Productivity application visualizes site-level data from the onboard systems across a fleet of machines and assets, transmitted by a Cat Product Link telematics device. Accessible via web browsers on desktop and mobile devices, users can analyze and compare Cat Productivity's consolidated and actionable site-level data and easily spot opportunities to lower cost and improve efficiency. This is all done ‘on the go,' without the need to visit a physical jobsite. "Cat Productivity makes it easy for customers to dig into actionable production details and harness site-level data - taking the guesswork out of jobsite performance," said Fred Rio, product manager for Caterpillar's Construction Digital & Technology division. "Users can see which machines are productive, which are not and why, so corrective measures can be taken." Cat Productivity pulls information directly from the "brains" of the machines to track and report detailed information on what the machine is doing. Reports and dashboards can be delivered directly to a user via email. Key data metrics include: idle time, fuel burn, location, payload, material and truck ID, speed, pass counts, total cycles and more. Additional analytics are provided by Cat Productivity to deliver an added layer of sophisticated insight and actionable information. Acting on that information results in dramatically improved machine efficiency, productivity, utilization and reduced per unit costs. Cat Productivity is available for a broad range of new and legacy Cat machines, as well as other brands. Additional hardware may be required. Cat Productivity pulls information directly from the "brains" of the machines to track and report detailed information on what the machine is doing. Trimble's FieldMaster Logs application has been registered with the Federal Motor Carrier Safety Administration (FMCSA) as a self-certified Electronic Logging Device (ELD) solution.